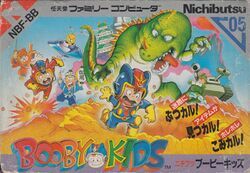 Booby Kids is an action game developed for the Famicom by Nichibutsu and published in Japan in 1987. It is the home conversion of Nichibutsu's arcade game known as Kid no Hore Hore Daisakusen, which was originally intended to be called Booby Kids. The Famicom conversion keeps the original title. Despite having never been released outside of Japan, it is completely playable by non-Japanese speakers. Booby Kids takes the basic premise of Kid no Hore Hore Daisakusen and expands upon it just slightly. Instead of bouncing around the five time periods like in the arcade, the player must proceed through four stages of one time period before advancing to the next. Many of the items in the Famicom conversion are identical or similar to those found in the arcade conversion. However, the levels are a little less maze like, and more varied in their layout. Access to certain regions of the stage must be discovered, or opened by bombs. This page was last edited on 6 January 2010, at 03:28.